Source: SSA History Archives, via Larry DeWitt. Last week, I had the good fortune to present an invited talk at the Radcliffe Workshop on Technology and Archival Processing, a small gathering of archives professionals from Harvard and other New England institutions. The Workshop is put together by the staff of the Schlesinger Library on the History of Women in America, where I’ve been a frequent visitor, camera in hand, shooting research-quality images of their collections. I was invited to participate in a session on “Processing for End Users,” but rather than rehashing my posts on digital tools and archives research, I decided to present about my new project. 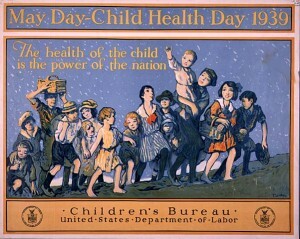 As some readers know, my dissertation research has relied substantially on the records of the United States Children’s Bureau, which was the first US federal agency established to focus on the wellbeing of mothers and children. The bureau’s period of greatest influence was between 1912 and 1939, when it pioneered programs which were the forerunners of the modern US social-welfare state. It’s been the subject of important books by, among others, Robyn Muncy, Molly Ladd-Taylor, and Kriste Lindenmeyer. Historians who work on the history of US women are in the Children’s Bureau files constantly, because they’re a great source, especially for correspondence from ordinary mothers about the realities of pregnancy and childbearing. But when you poke through the files, you see all kinds of topics covered: public health, both US and international; family law and legal reform; child labor; adoption; early 20th century information technologies. This is a fabulous collection, but it’s underutilized because it’s huge and there’s no comprehensive documentation of what’s there. The Children’s Bureau’s official records have only been partially microfilmed, and they’re very minimally processed. According to NARA’s preliminary inventory, published in 1976, the Central File records from 1914-1940 alone contain 450 linear feet of textual material. They’re unrestricted (open to the public), kept in Record Group 103 at the National Archives and Records Administration in College Park, Maryland. When I’ve visited College Park to work in this collection, I’ve brought back gigabytes of images which I don’t want any future researcher to have to duplicate in her own research. So why not start a collaborative project where we can work together to build a virtual collection of these materials? It won’t be complete or perfect, but it’ll be a way to expose these amazing sources for use in teaching and research about US women’s history. And some of the technology already exists for transcribing the manuscript letters in the collection: Scripto, the NEH-funded crowdsourced-transcription tool built at the Rosenzweig Center for History and New Media. Launching today is the website for the United States Children’s Bureau Papers Project, which aims to create a crowdsourced version of NARA Record Group 103, 1912-1947. At the first blog post there, I’ve posted a short PDF description of the project and the slides from my Radcliffe talk. Suffice to say that this isn’t a project I can do alone, especially in my first year of a faculty job. Accordingly, I’m looking for collaborators from the worlds of open-source software, archives, and/or historical scholarship. If you’re interested in participating, please drop me email or comment below. I’ll post more in the future about what might be useful, but in the meantime, I just wanted to get this news out there. Have you thought about linking this to NARA’s Citizen Archivist initiative? This is exciting news. I’ll be sure to spread the word to other grad students at American U. I hope you’ll post later about your process – scanning, converting, importing – because I’d love to hear more about it! I’m heading to Archives II next week to start digging into the letters sent to the USCB about infant care. (I’m writing a history of babies in the 2oth century US — and I think I met you at the Berks). At any rate, I’m happy to contribute to this project. Next week is a scouting trip to learn where the materials are that I need and how to use them efficiently; I’ll be making regular visits in the fall. I’m happy to upload images and transcribe letters, but I need a lot of instruction. What do I do? And how do I use what you’ve already found? From your scouting trip next week, the most useful thing we could have would be a set of images of the handwritten box lists and numerical-filing-system subject information that’s kept in the finding-aids binders. (I’m assuming that you’ve probably already found my basic suggestions for photography of archival materials.) Those lists are all we researchers have for a finding aid right now, and collaboratively creating a better finding aid would be really useful. If you have a Dropbox account, that might be the best way to share those images with me, and then I can put them online more permanently when I have time. Offhand, I suspect that the best way to do the initial transcription of those lists is in a structured format like a spreadsheet, maybe at Google Docs for collaboration purposes. Once we detail the numerical filing codes in use for each 4-year group of boxes, we can take that spreadsheet and link it to the RG 102 finding aid at the Our Archives Wiki. I do need to get around to uploading my images in a publicly-accessible way; I’ve been delaying until I’ve figured out how to do so in a way that’ll give them relatively permanent URLs. In the meantime, I can tell you that I’ve got quite a bit of the filing series 4-2, especially 4-2-1-2-1 (birth certificates and birth registration); my most complete image sets are from the boxes covering 1916-1920, 1921-1924, 1925-1928, and 1929-1933. Of course, I was photographing selectively for my own research interests, but some of what I found will probably be useful to you. Really, what needs to happen here is that I need to take some time and set up Scripto properly so that the transcription process can proceed. I’m guessing that, since I’m teaching 2 new-to-me courses this semester, this will have to wait until sometime in the fall unless I magically acquire a research assistant. I’ll let you know as things progress. Thanks for the advice, which I will study and follow. I will be starting with record group 1914-1940 record group 4-4. I will (hopefully) learn the system this week and then make regular trips in the fall to work through the collection, once I figure out how to sample it or decide to just look for anecdotal material in support of my other sources. A quick question–do I need to use dropbox to store images rather than google docs?